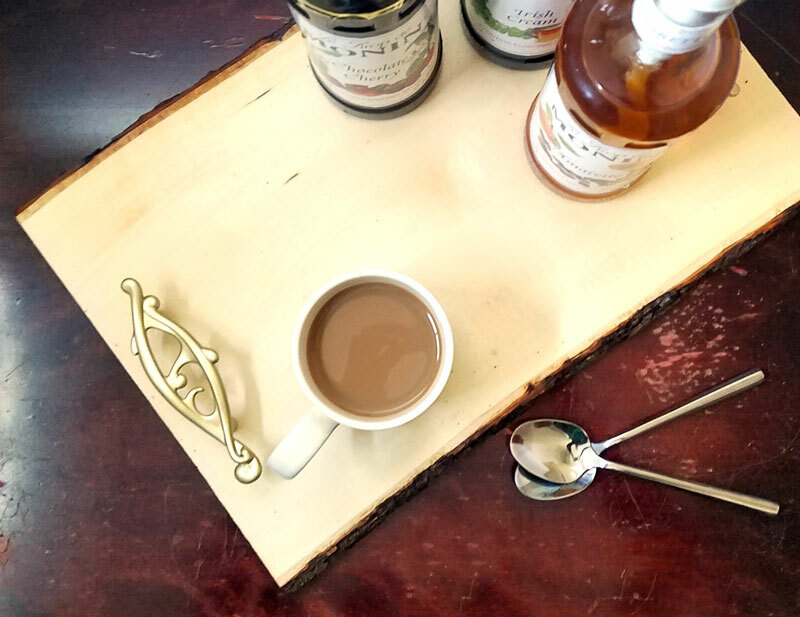 Home Crafts DIY Coffee Bar Tray for a fun flavoring station! All good moms have built up survival skills and mine includes lots and lots of coffee! 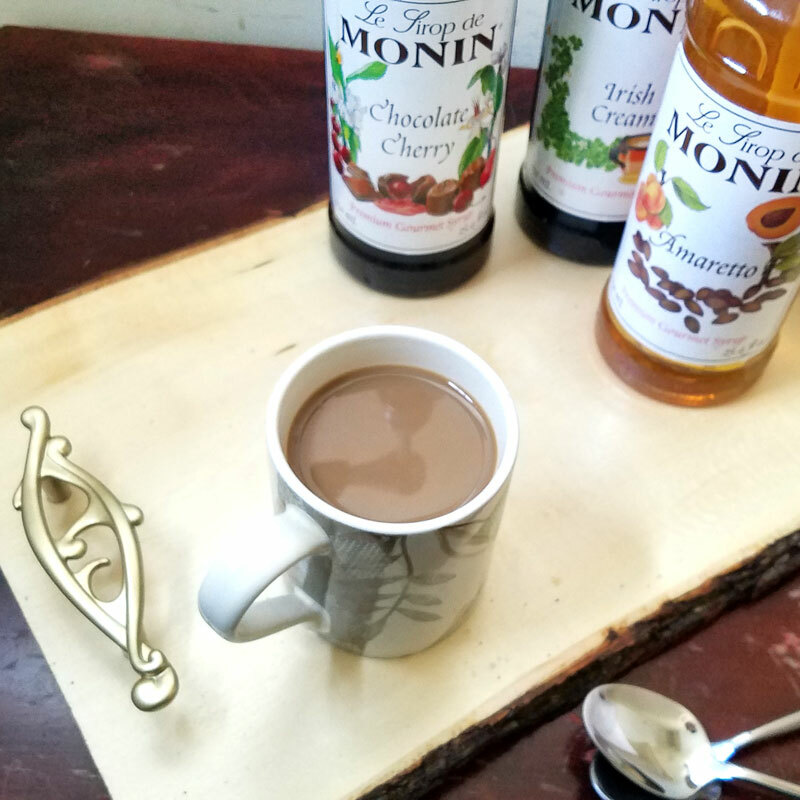 I partnered with Monin Gourmet Flavorings to bring you this surprisingly easy DIY coffee bar tray to make! Use it at your next get-together, or set up a coffee bar in your own home. 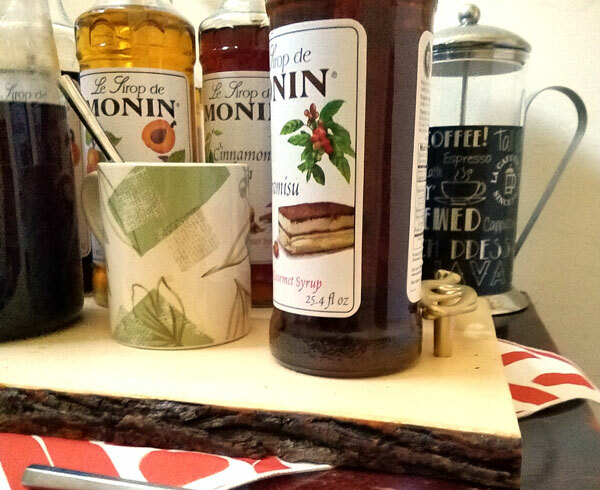 I wanted a great way to corral flavoring syrups at a party while protecting my surface. I also wanted something nice that will look great in a coffee bar in my own kitchen. I work hard, so do you, and a little treat is always called for. 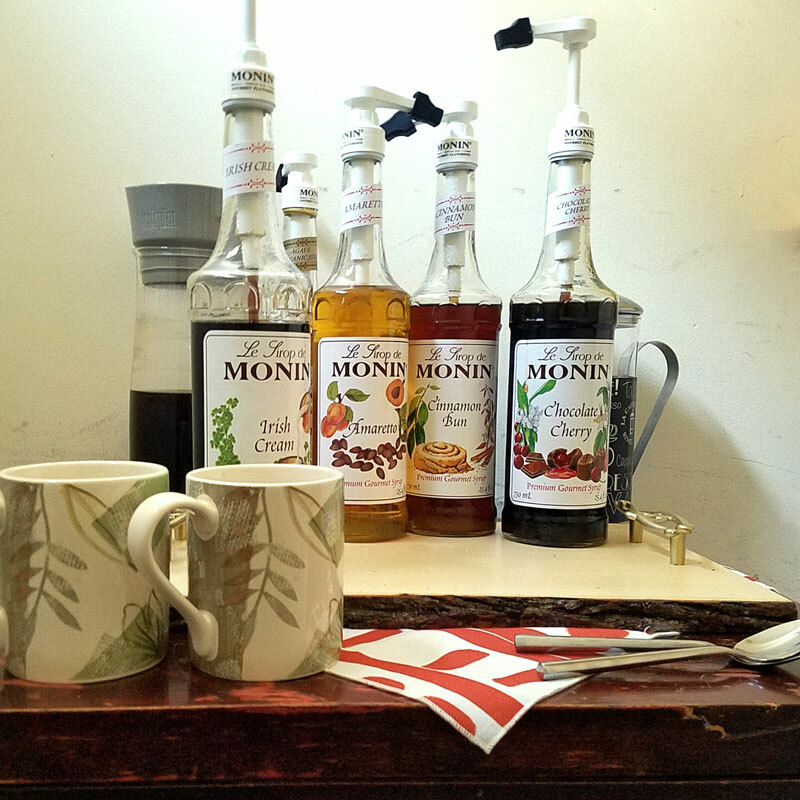 Monin Gourmet Flavorings help seriously upgrade my coffee. Coffee is what I run on, and it’s my main break, so why not make it even better? 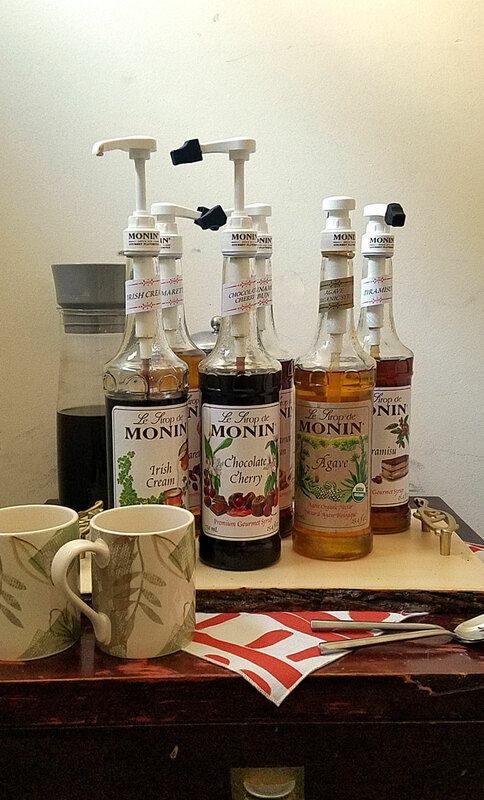 For my coffees, I love using Monin, because many of their syrups are naturally flavored without artificial ingredients. 12 oz. freshly brewed coffee, 1 oz. milk, and 4 pumps Irish cream – even better when topped with whipped cream! Freshly brewed coffee with bakery flavors – like Tiramisu and Cinnamon bun! I also like mixing syrups – like Amaretto and Irish Cream go great together! 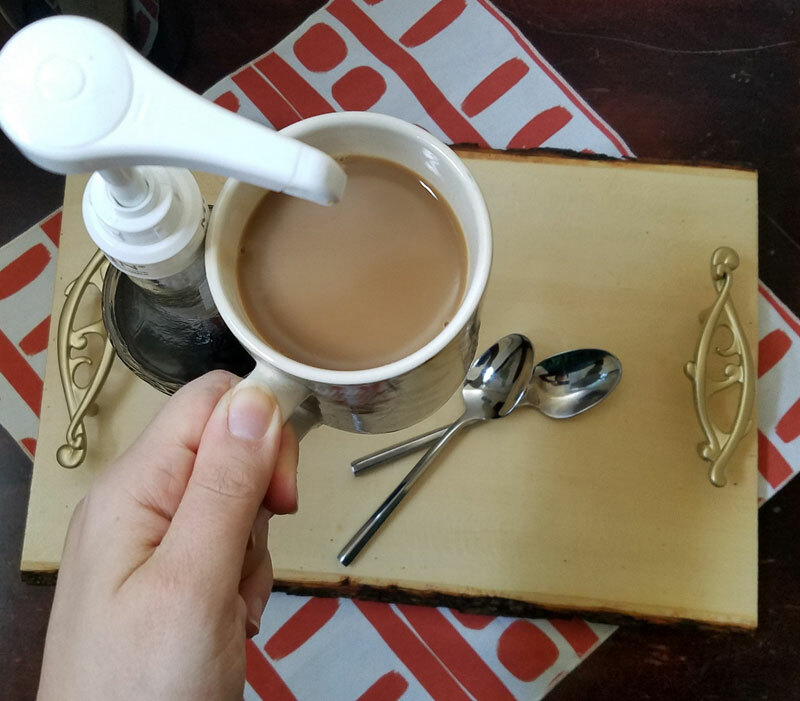 Anyway, this easy DIY coffee bar tray really takes under half an hour active time. 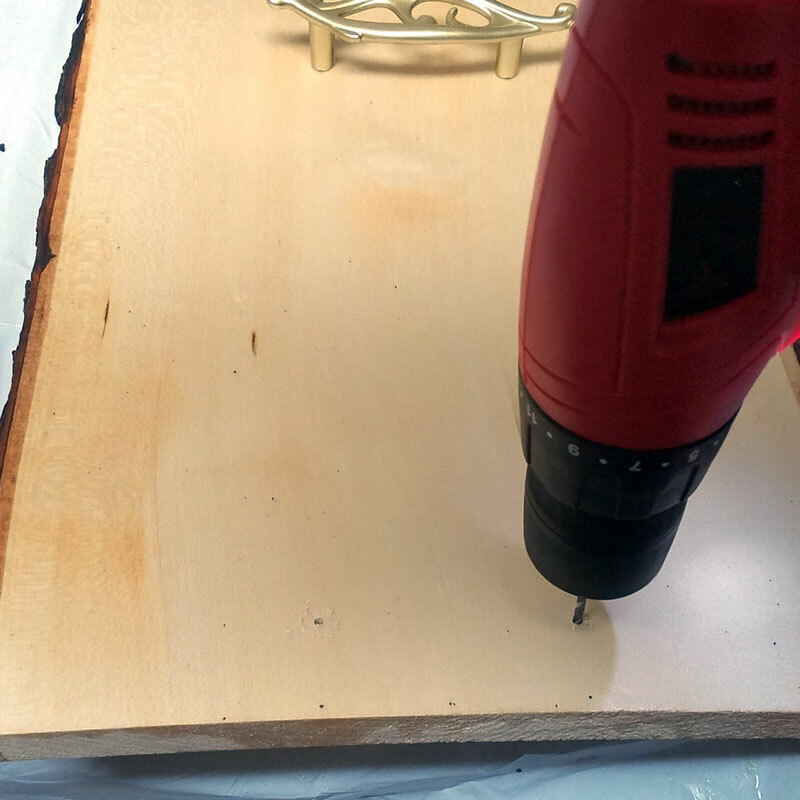 You do need to know how to handle a drill but that’s it – making this the perfect project for the DIY novice. The wood I chose has the bark intact, and from there I simply added cabinet hardware. I actually decided mine would look nicer in gold, so I spray painted them, but naturally you can skip that step. I wanted a tray with easy access – as opposed to a rimmed serving tray. 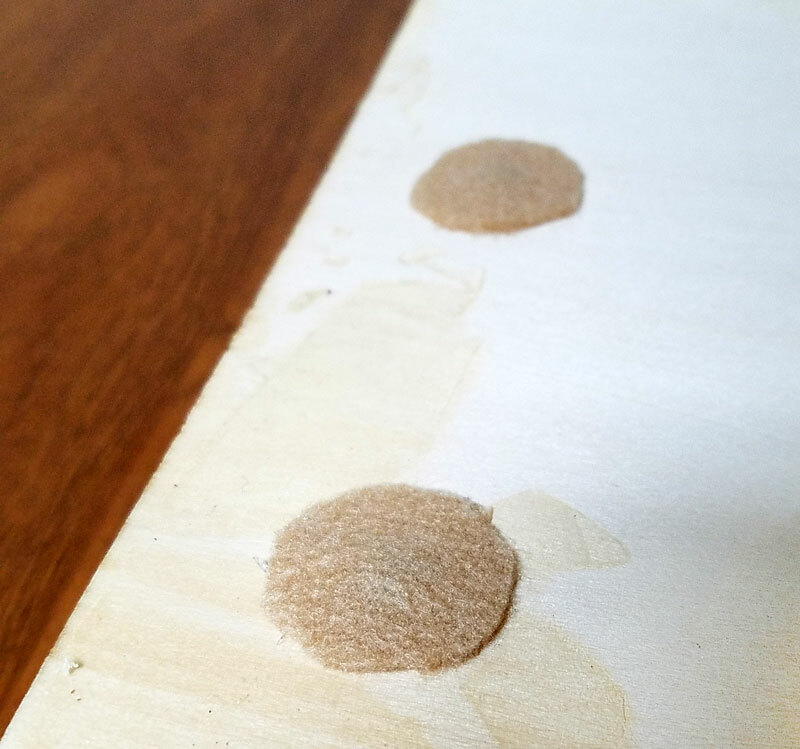 This tray helps protect my surface from drips, while corralling the syrups. You can set it up as a centerpiece at a get-together with friends, or display it on a non-alcoholic bar cart with coffee as the star! 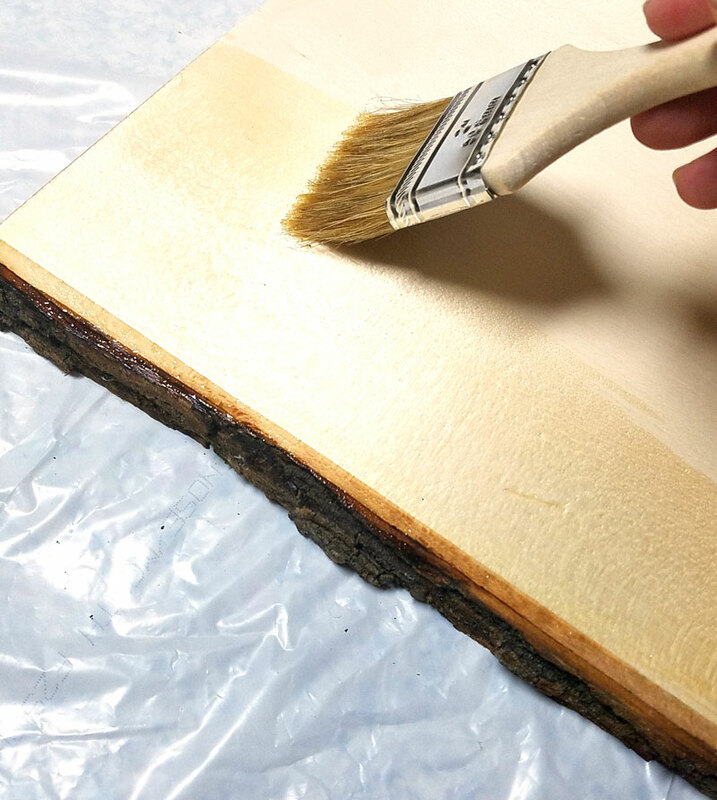 Stain if you want (I didn’t use) and polyurethane to protect the wood. I used semi-gloss, you can also use gloss – just make sure it wipes well! Cabinet hardware of your choice. 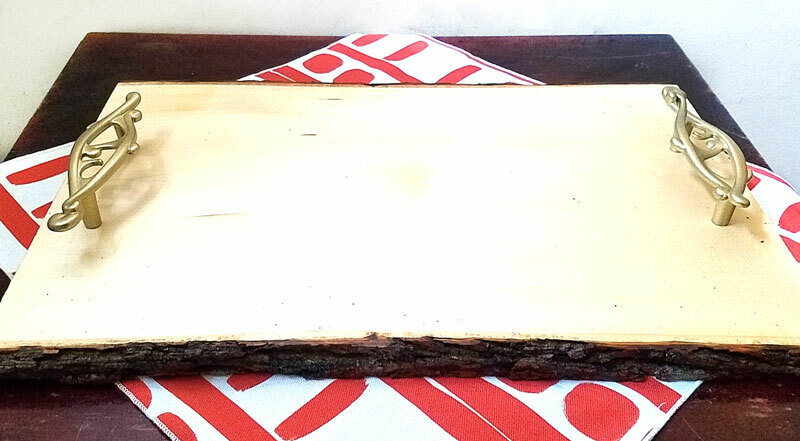 I chose one that is reminiscent of nature to go with my wood. 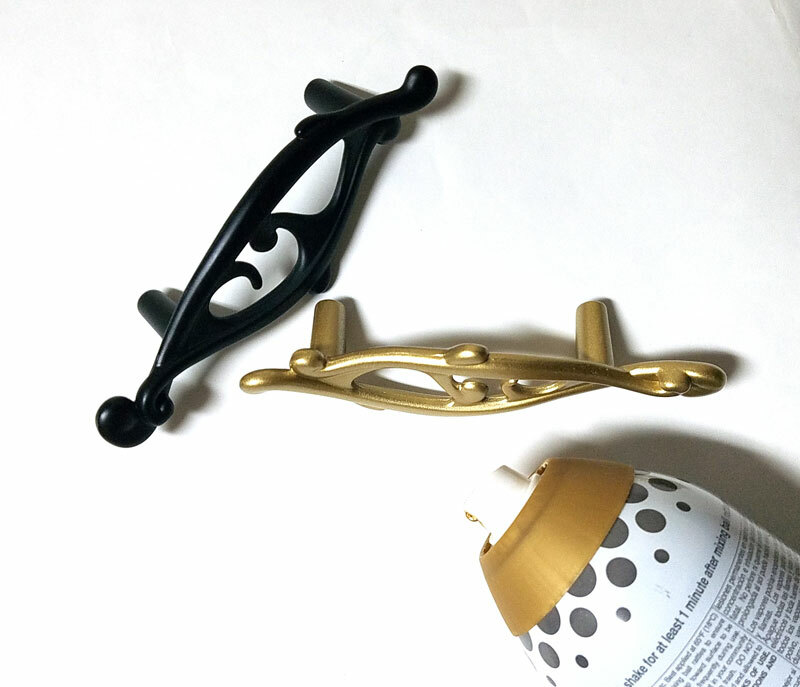 2.If you want to customize the color of your hardware, spray paint it and let it dry. 3. 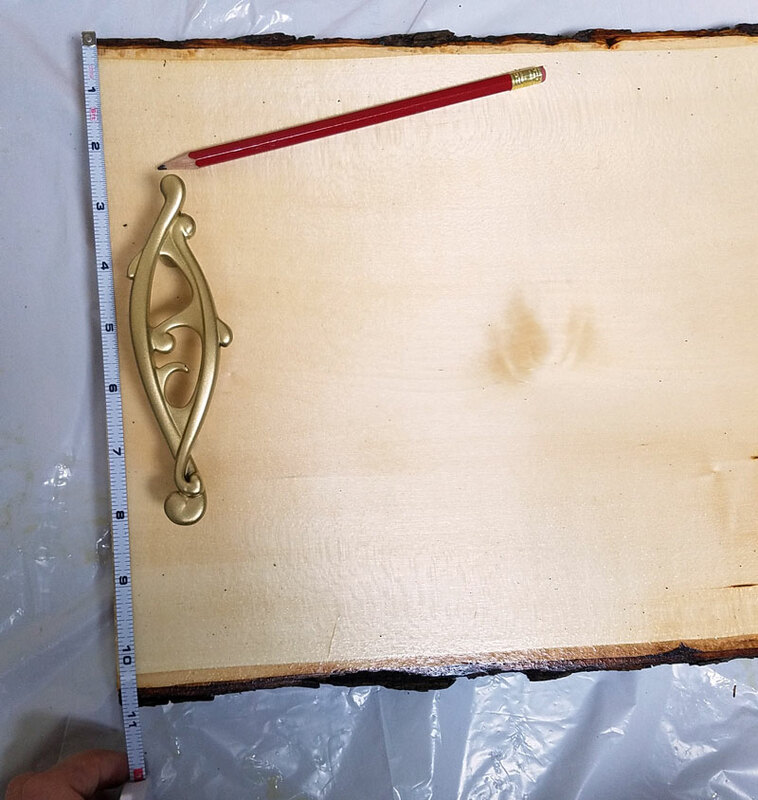 Measure the center point of your wood, and then measure the handle placement from there. 5. Screw your hardware in place. 6.Cut four round circles out of felt. 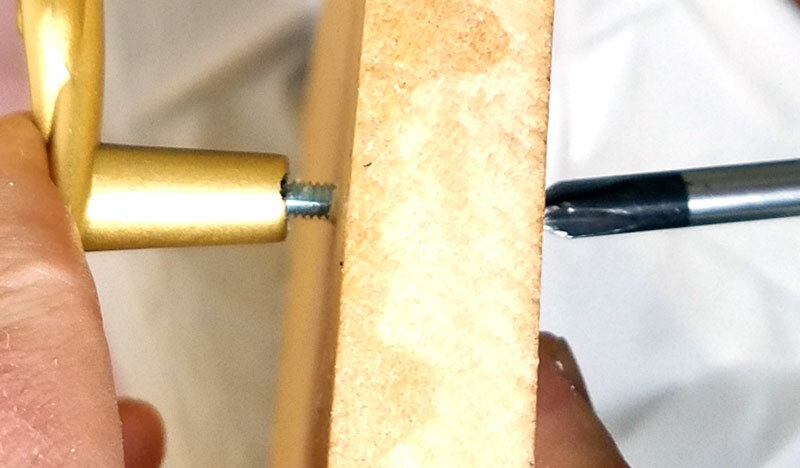 Glue them in place over the screws (in case you do ever want to repurpose the wood, I’d recommend avoiding the actual screws, and placing the glue around the perimeter of the circle). This lets it glide along a surface easily without scratching. 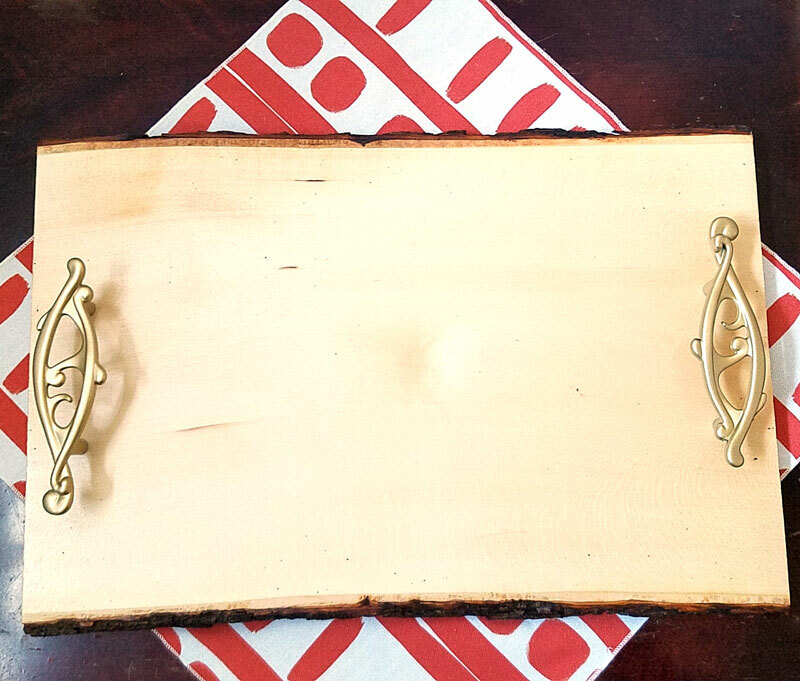 You now have a beautiful coffee bar tray, ready to be stocked! 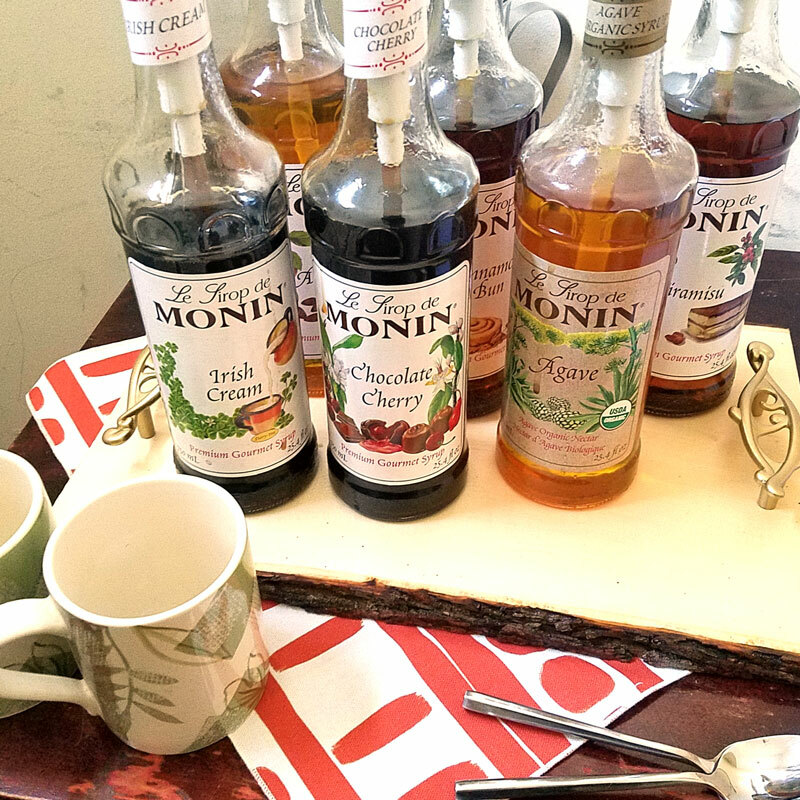 I set mine up with five Monin flavors, plus Agave syrup so that people can customize the level of flavor and sweetness separately. Put out a carafe of cold brewed coffee (it has less of an intense flavor and goes very well with flavor). Put out a French Press with hot coffee for those who want strong coffee impact. Make sure to leave plenty of space on your coffee bar tray for people to see what you have to offer and to place their cup down. Which is your favorite coffee flavor? How would you arrange your coffee bar tray? Comment below! Crafts for Adults, Grown-ups, Home and Organization, Home Crafts and DIY, Quick and easy crafts, sponsored. Bookmark. I’m not a big coffee drinker unless they are flavored. I usually buy my flavored lattes at the coffee shop, but now I might make my own. Thanks for the idea. Hi Jodie! These are delicious – and a lot easier than going to the shop! I LOVE this idea! So simple and beautiful. I just recently set up a specific area to feed my coffee addiction and this will be a nice addition. I’ll have to come back for the tutorial once I get the supplies. Also, I didn’t know Monin had Cinnamon Bun and Tiramisu! Yum. I used to have over 20 coffee syrup flavors to go with my espresso maker (since I wanted to open a coffee shop) so these super excite me. I’ll have to check them out. Love this! We are big coffee drinkers – I need to set this up for our next big family dinner. Thanks! So I’m a decaf drinker and flavored decaf is almost impossible to find. These syrups have me intrigued! I miss flavored coffee so much!! How do you survive on decaf? HAHA just kidding. Wow! I love this project so much and those syrups!!!! I have a tea cart and now I want to change it into a coffee cart and get those syrups and make this project! Thanks for sharing. You need that coffee, mama! Hazelnut – that’s my favorite flavor. I love the look of the hardware after you spray painted them. What a great detail! I need one of these coffee bars in my house. You might just have tempted me to try coffee again. 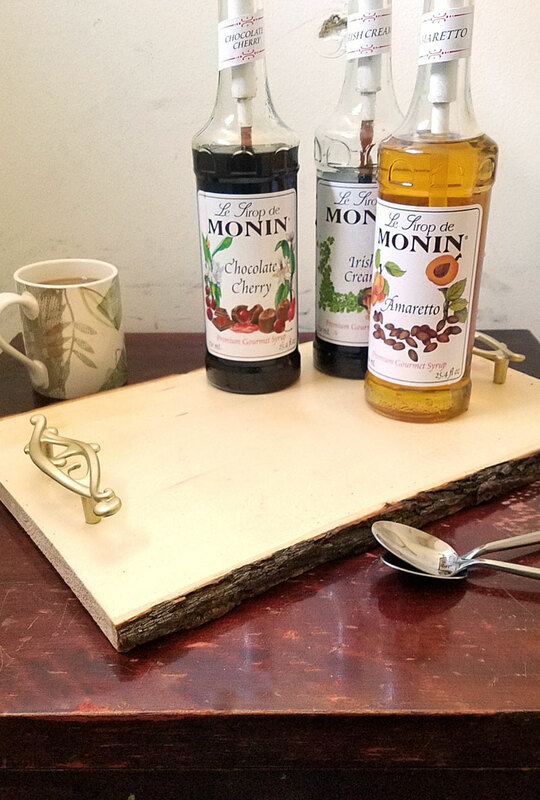 Love your DIY Coffee Bar tray as well. It would work for tea as well right?!? Yes it would! I actually love how the Agave syrup goes with tea! I love your coffee tray. AND I so love my coffee…usually black and non sweet. But I do like a flavored coffee now and then. I make mine at least with half the flavor as others like. I love the Pumpkin Spice in winter or holiday times. Recently I bought the can of whipped topping in mocha to try. Yummm delicious though a little pricey. Now I wish I had bought the Butterfly handles I just saw in Joann Fabrics…I mean only an hour ago I thought “I need a use for those butterflies”. Ta Da I do now. Lol. Thanks for the wonderful idea. And ignore the “debby downers” they must be unhappy in their own little world. Thank you! You’d like two pumps of the syrup then – I like my coffee SWEEET!! Ha! And those butterfly handles look lovely!